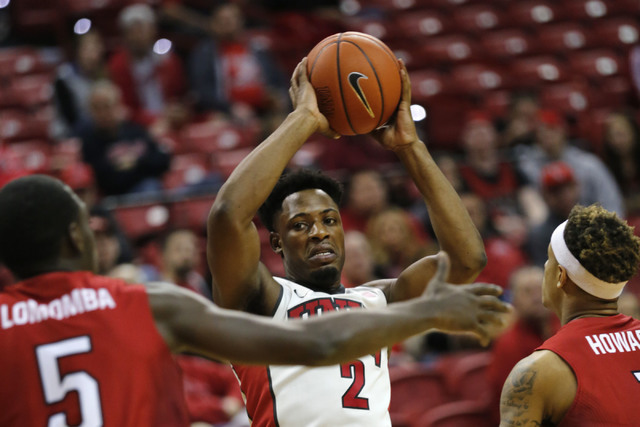 Three takeaways from the UNLV basketball team’s 71-61 victory over Western Kentucky on Saturday at the Thomas & Mack Center. 1. UNLV showed it has fortitude. The Rebels could have handled Friday’s 63-59 loss to Texas Christian one of two ways. They could have gotten down on themselves and not played with energy against the Hilltoppers. Or they could have come out determined to not repeat what happened against the Horned Frogs. UNLV chose the latter, and not only scored the game’s first 10 points, but responded well when Western Kentucky made its expected runs. Being able to bounce back will be important in what should be tough times ahead with some demanding games in December, notably against Arizona State, Duke, Oregon and Kansas. 2. Get used to the new normal. That is playing against zone defenses. TCU frustrated the Rebels, who didn’t handle that defense well. They were sloppy in committing 19 turnovers and giving away a winnable game. UNLV had some early problems against Western Kentucky’s zone, but settled down and became more patient. The Rebels committed only 11 turnovers. It made a difference. UNLV actually shot well from outside against the Frogs, making 9 of 19 3-pointers. They made 13 of 29 against Western Kentucky, but didn’t have the wasted possessions, which turned out to be the difference in the two games. Tyrell Green and Jalen Poyser took the bulk of the 3s, going a combined 11 for 17 from the arc and scoring 45 points. Expect opponents to continue to zone the Rebels, though, who because of their injury problems up front have become a jump-shooting team. Which means sometimes they will shoot their way to victory, and other times relying on the 3-pointer will do them in. Opponents will likely test which UNLV team shows up on a nightly basis. 3. There’s always another challenge. UNLV has been faced with playing without key players in its frontcourt, playing back-to-back games, and trying to overcome the zone defense. Now UNLV gets to see what life on the road is like when it travels to Southern Utah on Wednesday. That game will have the added element of facing coach Todd Simon, who was UNLV’s interim coach last season. How the Rebels handle the road will provide some insight on what to expect in the future when the opposing arenas will be even more intense.